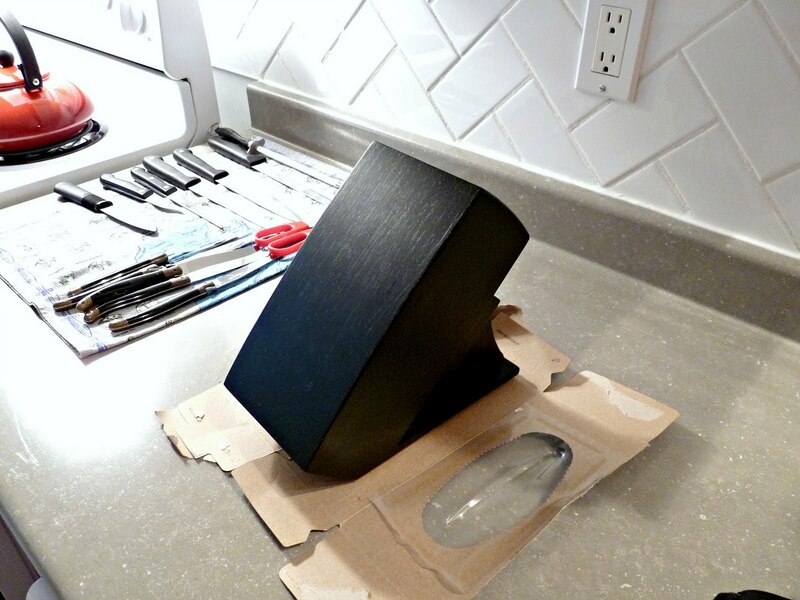 Want a knife block you can doodle on?﻿ Here’s how you can easily re-paint your knife block, using chalkboard paint. 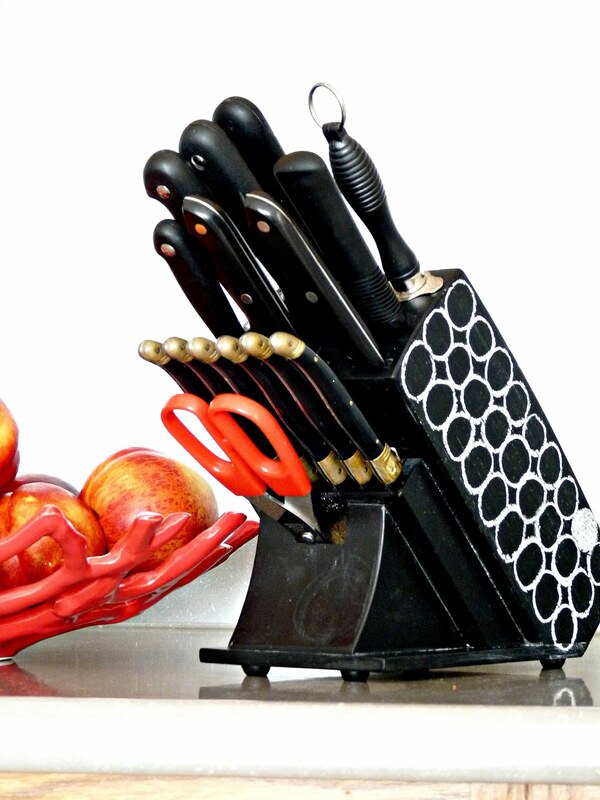 Our knife block, a cheap-o Winner’s purchase from four years ago, was looking a bit worse for wear. Due to my excessive cleaning, I had managed to scrub most of the varnish off and I wasn’t a fan of the light wood in our kitchen. 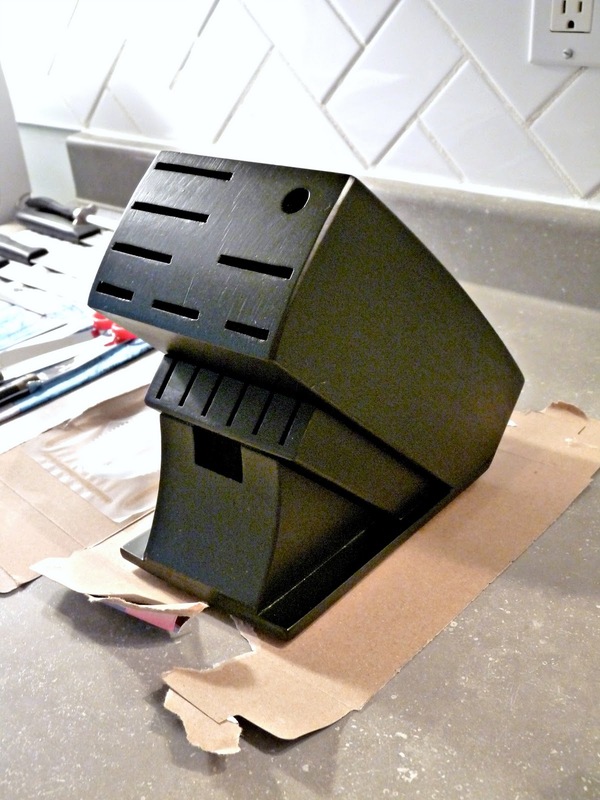 I had a can of chalkboard spray paint lying around because I opted not to paint the magnetic memo board I made. 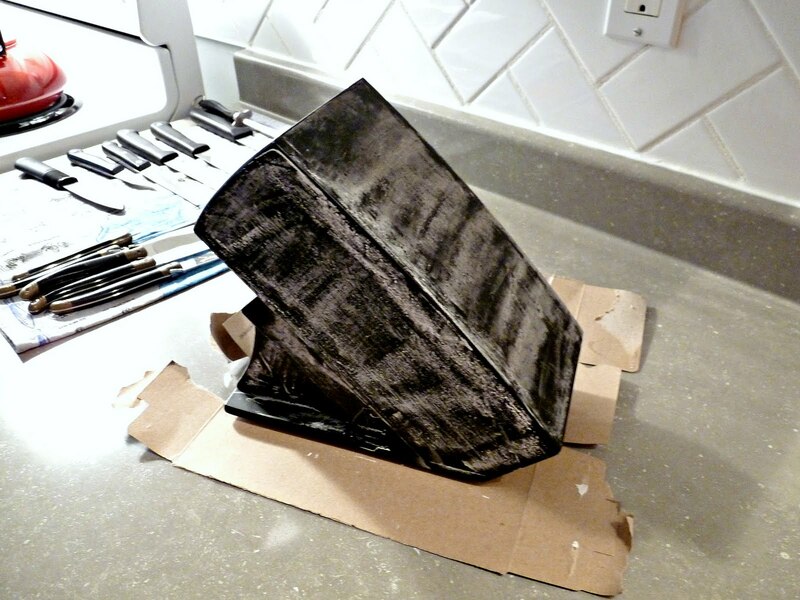 But that meant I hadn’t actually tried super trendy chalkboard paint. And all the cool kids are doing it. 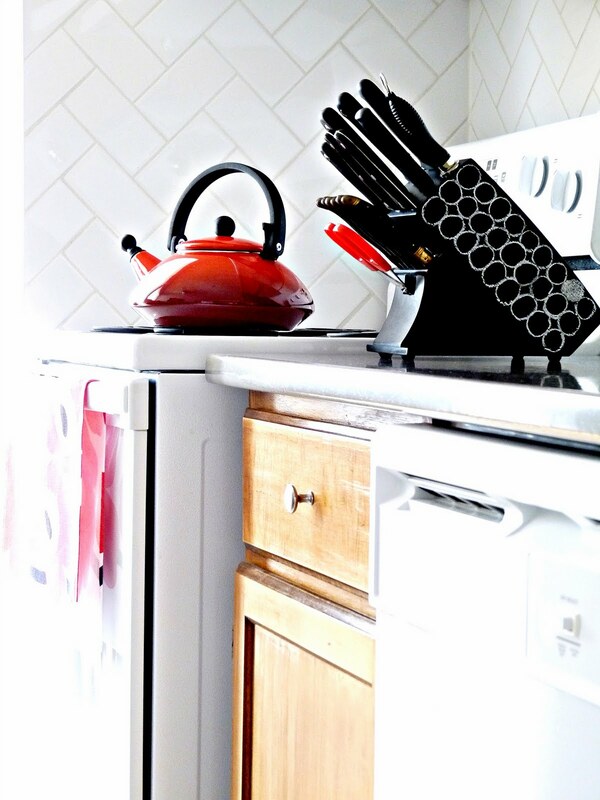 So I thought the lonely can of paint + an ugly worn-out knife block = fun kitchen accessory, without spending any money! Then I wiped the chalk off using a damp cloth. Apparently this “conditions” the chalkboard surface. Can you imagine doing this for an entire chalkboard wall?!? I love the look! Even as a plain black knife block I think it looks better: crisper, more modern and it fits with the ﻿other black accessories in the kitchen. 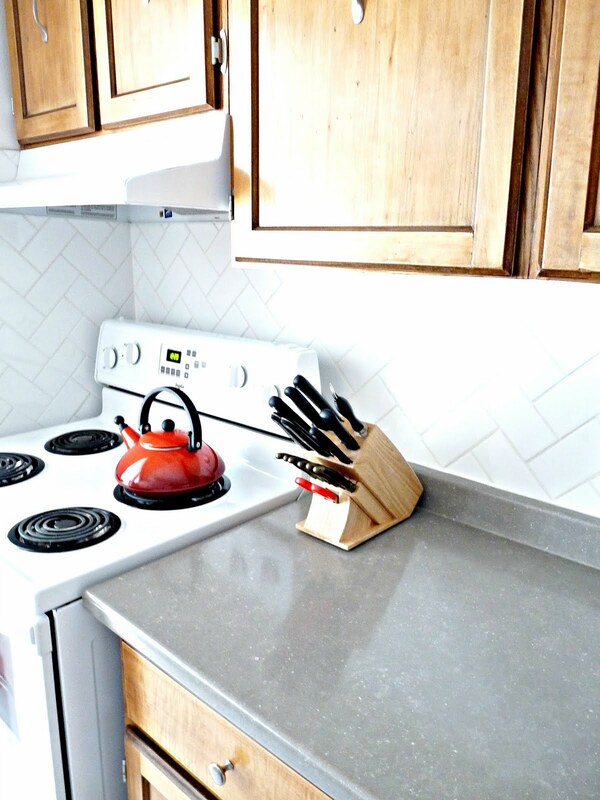 Check out these other knife block makeovers – I promise you’ll be inspired! Use a very fine sandpaper because﻿ any scrapes or scratches in the wood will be made more visible by the matte paint. Don’t paint rubber feet – the paint would NOT dry on the rubber feet so I had to spend a few minutes scrubbing them clean with paint remover. Be a bit more generous with the “conditioning” process. The amount of chalk I used was insufficient and sometimes what I draw won’t erase easily, but I still love it. 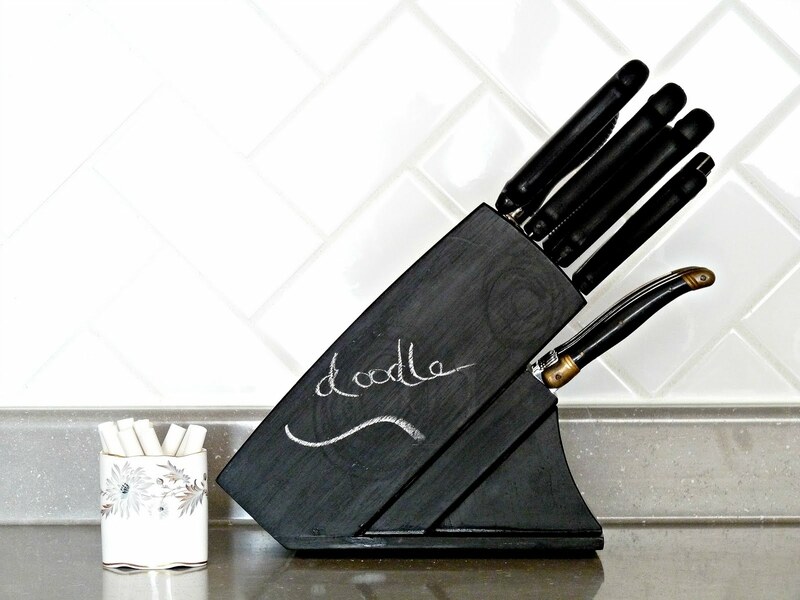 Wow – chalkboard paint on a knife block? So cool. I love this project! it never even occurred to me that I could paint this bad boy!Good Jobbie! How fun is that! Even if you don't do much doodling it looks great with the black paint. Thanks!Carol: I don't doodle that much either. I kind of settled on a doodle and it stayed. But I do like the graphic look. Oh you little smarty pants, you. That's freaking awesome! Great idea! I love chalkboard paint. I did a kitchen door in it at my last house, and Carl and I used it for notes to each other and for our grocery lists. I also did a door in the rumpus room at my daughter's house, and I drew funny little cartoons on it for my grandson. 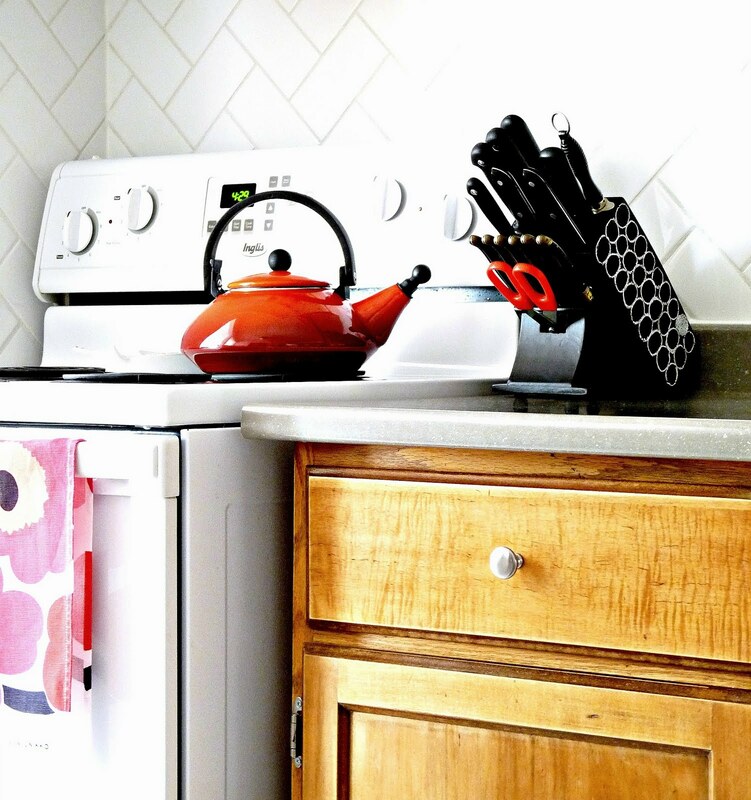 I think that's an awesome idea, but I couldn't take my eyes off that tea kettle. Thanks! 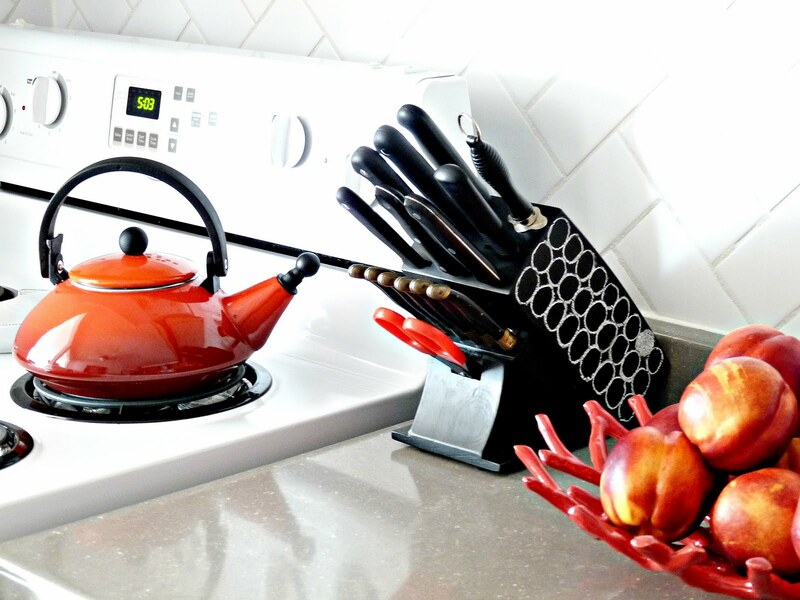 The tea kettle is by Le Creuset (which is pricey) but I got it at Winner's, where it was steeply discounted. I've seen them at TJ Maxx, in the States, and also at Le Creuset outlet malls. What a great idea! 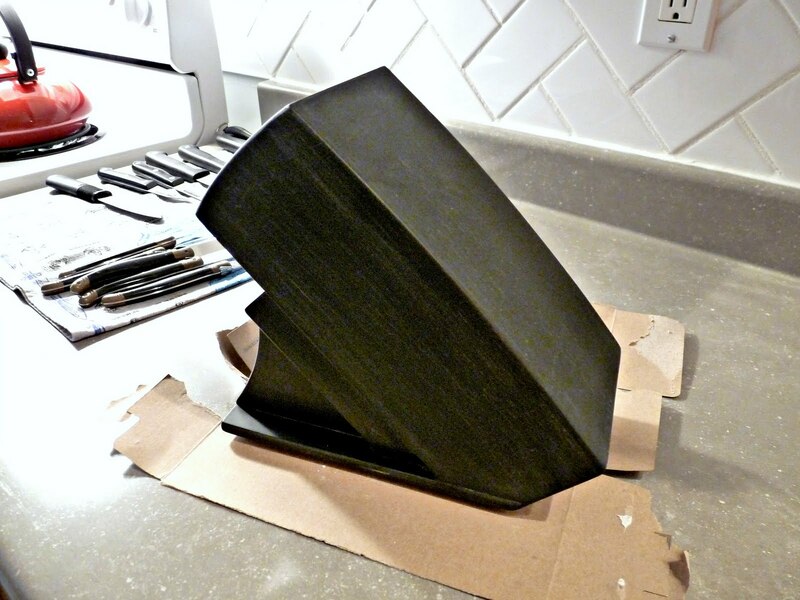 I was just thinking the other day that we needed to get rid of our knife block because it starts too look ugly.